The kids and I ran to town after several weeks in cow camp. We ran errands, got their hair cut and went to the museum. We tried to do this a few months ago but the museum had been closed for the season. It has been all that Sam and I heard about, so I made it happen. 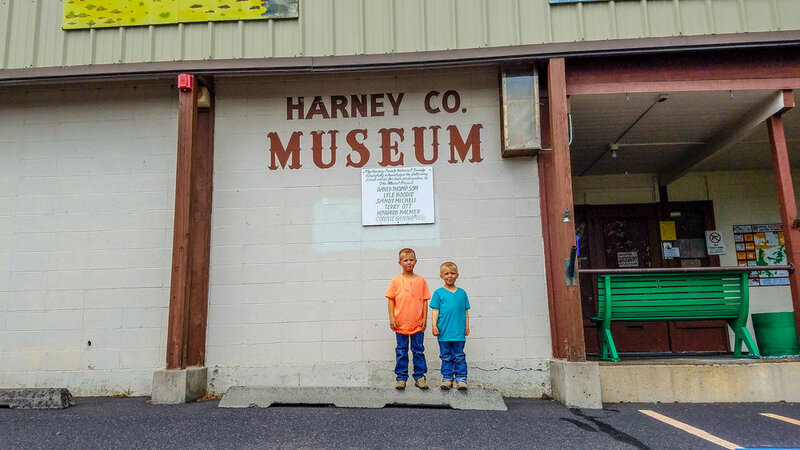 Upon arriving, we discussed that this museum was about Harney County. Everything in it would have been from here or owned by people that had lived here. We talked about how we would behave and its significance to the valuable items we would see. Upon walking in, their little legs carried them to whatever captivated their minds. I quickly realized that the would not be possible in the two story, historical collection of Harney County. As the boys began asking if this picture or that was Pete French because of our trip to the Round Barn a few weeks before (read about it here), a new idea occurred to me. First, we had to get a handle on this over excited pursuit of things that interested them without killing their desire to learn. Second, I had to change my expectations of this adventure. Third, if things didn’t change, no one would enjoy the remainder of the day. We quickly discussed their behavior and I allowed the boys to lead me to whatever caught their attention. They had to wait for each other, but the energy level dropped dramatically! My trivia and quick reading skills were pushed to the max as we switched from switch boards to local logging to natural history of our bird population. I found them a few photos of Pete French and a saddle thought to have been his. They asked lots of questions about the military displays full of firearms and uniforms. There was one item that held their attention for five minutes, which is impressive at ages 4 and 6! It was a McClellan saddle and the questions came at me rapid fire. Quirt is my child that picks up on phrases in poems or songs and asks about their meaning. Immediately, a line stood out to him, so I stopped the music to talk about it. Thru this discussion, he started to understand why soldiers would need another occupation after the war and that a different saddle may be part of that change. I mess up on parenting A LOT! I was taken aback by the history and timelines my boys were able to understand already, the connections they made between things. It has inspired me to continue putting “field trip” opportunities before them because they are gaining more than I realize. Sam and I both love history though, so with a slight adjustment of my expectations, I think there will be many more adventures in our future!